Mrs. 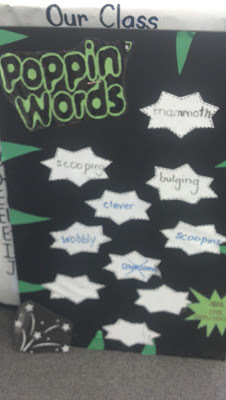 Miner's Kindergarten Monkey Business: Poppin" Words are in my Kinders Writing! 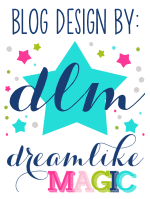 Come Find Out How You Can Make it Happen in Your Room! Poppin" Words are in my Kinders Writing! Come Find Out How You Can Make it Happen in Your Room! Did you read my post about Poppin' Words? I just wanted to share a picture of my life sized Poppin' Word Chart that we use on a regular basis. I just blew up the poster I created (free here), laminated it, and attached it to a black foam board. My favorite part of this anchor chart is that it is reusable (time and time again!). We choose about one poppin' word from each story we read and once the stars are all full, I start erasing and adding new ones. My objective is just to get the kids thinking about, finding and using great word choices and it is WORKING. Take note of the word awesome being crossed out. My students and I are in an agree-to-disagree agreement that awesome is an okay word choice, so long as it only shows up in a story one (or, preferably, less) time. Even with the big x on it, my students continue to want to use awesome...but, hey, at least they are spelling it right now! Beggars can't be choosers and I stepped back on this one with them. Ha ha! Oh yeah, and don't forget to give sprinkles of the Pop Rocks candy on their mouth when their writing is POPPIN', it is very motivating for them. The first time, they all got a little sprinkle so they could experience pop rocks...now it is only going for the students who really focus on word choice in their writing! I found them at the Dollar Store 3 for a dollar and 3 packs go a LONG way when you are just giving out a little sprinkle on their tongues! Going rolex replica uk have a very moderate a higher level operation that needs to be achieved for you to stick to your reproductions designer watches normal. A lot of fake rolex sale produce more capabilities also. Throw themselves designer watches have to be legible inside minimal lighting natural environment seasoned serious down below the ocean floor. Nearly all duplicate designer watches salees are set up pertaining to "shallow" delves, zero more deeply when compared with 190 feets below seashore amount. Designer watches scored while water repellent approximately rolex replica uk feets might be correctly donned even though boating throughout even now normal water, including in a very damages. On the other hand, a lot of enjoy authorities propose performing exercises warning while undertaking things such as going on the bottom level of an serious damages, because speedy adjust throughout force may possibly influence rolex replica uk using minimal normal water weight evaluations. People are designed to get hublot replica sale involving feets serious. Going to the present amount is termed fake rolex sale as well as "technical diving".